Therefore, the given equation has no solution. Therefore, the given equation has infinitely many solution. Therefore, the given system will have unique solution for all real values of k other than 6. Therefore, the given system will have unique solution for all real values of k other than 4. ⇒ k can have any real values. Therefore, the given system will have unique solution for all real values of k.
Therefore, the given system will have unique solution for all real values of k other than 10. Therefore, the given system of equation will have infinitely many solutions, if k = 9. Therefore, the given system will have infinitely many solutions if k = 12. 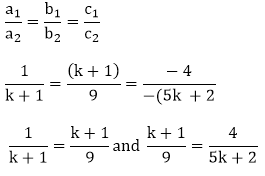 Therefore, the given system of equations will have infinitely many solutions, if k = 8/3. Therefore, the given system of equations will have infinitely many solutions, if k = 16. Therefore, the given system of equations will have infinitely many solutions, if k = 4. 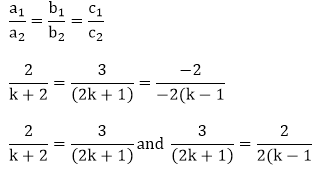 Thus, k = 2 satisfies both the condition. Therefore, the given system of equations will have infinitely many solutions, if k = 2. Therefore, the given system of equations will have infinitely many solutions, if k = 5. Therefore, the given system of equations will have infinitely many solutions, if k = 7. Therefore, the given system of equations will have no solutions, if k = −15. 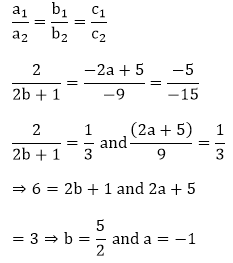 Therefore, the given system of equations will have no solutions, if k = 4. 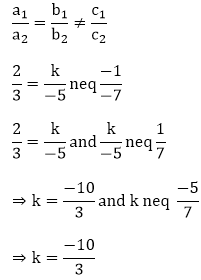 Therefore, the given system of equations will have no solutions, if k = - 9 /4. 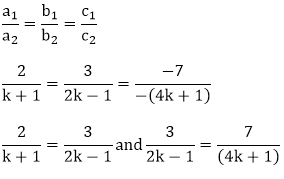 Therefore, the given system of equations will have no solutions, if k = – 4/3. Therefore, the given system of equations will have no solutions, if k = -14/5. Therefore, the given system of equations will have no solutions, if k = − 6. For what value of a, the following system of equation will be inconsistent? 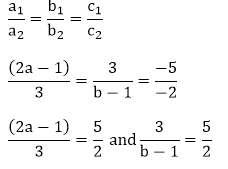 Therefore, the given system of equations will be inconsistent, if a = 3. 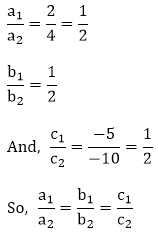 For what value of a, the following system of equation have no solution? ⇒ a = + 6 or – 6? Therefore, the given system of equations will have no solution, if a = − 6. Therefore, the given system of equations will have unique solution, if k ≠ 6 k ≠ 6. Therefore, the given system of equations will have no solution, if a = 6. 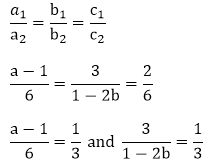 For what value of c, the following system of equation have infinitely many solution (where c ≠ 0 c ≠ 0)? Therefore, the given system of equations will have infinitely many solution, if c = 6. 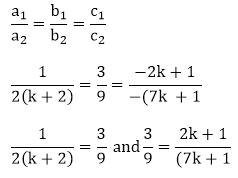 Therefore, the given system of equations will have unique solution, if k ≠ -10/3. Therefore, the given system of equations will have no solution, if k = -10)/3. So there is no value of k for which the given system of equation has infinitely many solution. 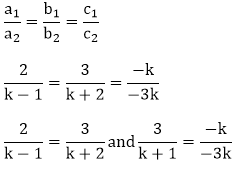 For what value of k, the following system of equation will represent the coincident lines? The given system of equation will represent the coincident lines if they have infinitely many solution. Therefore, the given system of equations will have infinitely many solution, if k = 4. 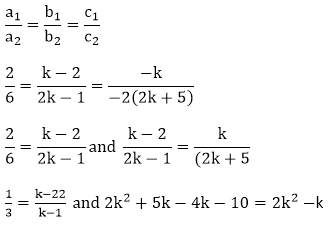 Find the value of k, for which the following system of equation have unique solution. 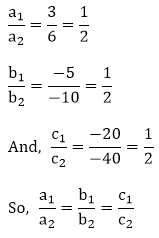 Therefore, the given system of equations will have unique solution, if am ≠ bl. 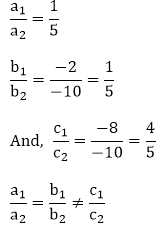 a = – 5 and b = –1. 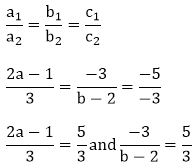 p = 5/3 and q = 1/3. 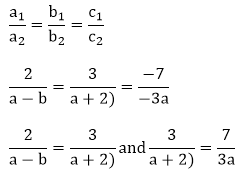 a = 3 and b = 1/5. 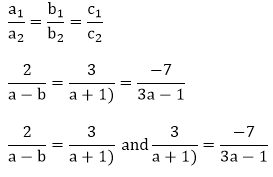 a = - 1 and b = 5/2. 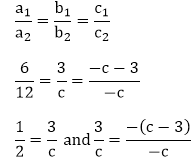 a = 3 and b = −4. 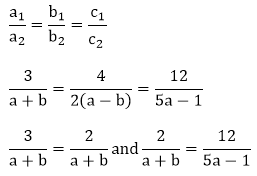 a = 5 and b = 1.
a = 5 and b = 1.
a = 7and b = 1.